Manufacturer of Pipe Making Machinery and Equipments. 1. 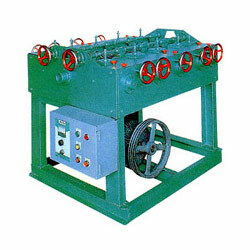 The machine is used mainly for straightening different types of steel pipe. It is easy to operate and provides satisfactory straightness. 2. This machine is suitable for straightening pipe products. 1. Applicable range (spec.m/n): 38.1~114.3. 2. Applicable range (length M): 3~7. 3. Polishing speed: 7 M/min. 4. Motor (HP): 20.